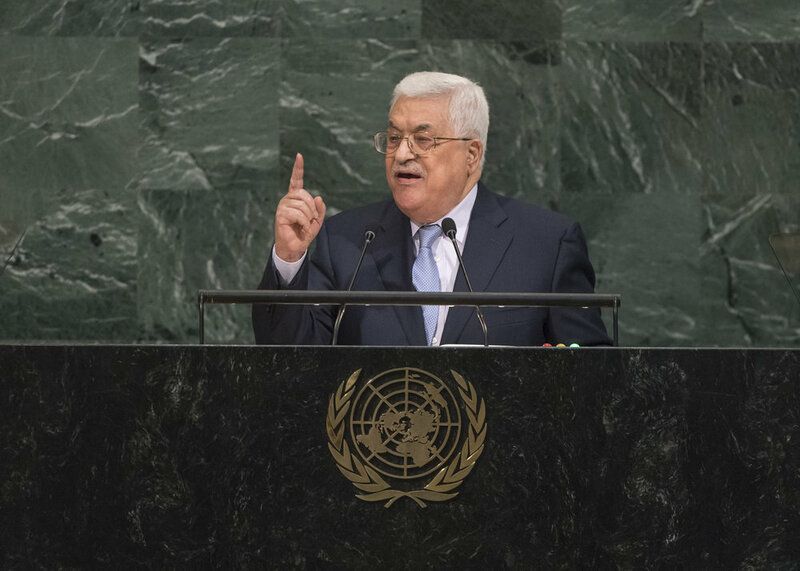 Palestinian Authority President Mahmoud Abbas addresses the general debate of the United Nations General Assembly on Sept. 20, 2017. Credit: U.N. Photo/Cia Pak. The recent moves at the United Nations by the Palestinian Authority (PA) and the Palestine Liberation Organization (PLO), who sought the vote condemning U.S. recognition of Jerusalem as Israel’s capital, mark the latest use of rejectionism as a tool in the PA-PLO arsenal of diplomatic warfare against Israel—and now America. Rather than engaging with Israel and the U.S., the PA and PLO continue to seek international diplomatic cover to circumvent direct negotiations. The PA’s policy of rejectionism and Mahmoud Abbas’s failure of leadership hamper rather than advance the interests of the Palestinian people. Moreover, the PA’s encouragement of violence and habitual “days of rage” again demonstrate its commitment not only to rejectionism but also to the threat, and use, of terrorism. Both are obstacles to the presumed goals of the Palestinian people: peace, statehood, economic development and a better life for all. Rejectionism is the refusal to accept the legitimacy and right of the Jewish people to a state in their ancestral homeland, and therefore deny the possibility of an agreement between the parties based on two states, one Jewish and one Arab. Rejectionism and terrorism are each serious and interconnected threats to peace, as is refusing to engage in diplomacy. The connection with terrorism is narrow and deadly because rejectionism demands not pursuing peace with Israel under any circumstances and at all costs, which creates a climate of hate that has spawned the belief that terrorism is justifiable under the guise of freedom fighting. Various Palestinian terror organizations—including the PFLP (Popular Front for the Liberation of Palestine), PIJ (Palestinian Islamic Jihad), PLO leadership and Hamas—are committed to maintaining violent and murderous campaigns against the State of Israel and her allies. Their intent has never been to establish a Palestinian Arab state, but rather to eliminate the world’s only Jewish and democratic state, and establish another Arab nation from the “river to the sea” in its place. Israel is often caught in this crossfire between terrorists and diplomats. Terrorists justify their attacks upon innocent civilians as tools that are necessary and appropriate in their quest to force the world to recognize an independent “State of Palestine” without compliance with the agreements previously signed between the Palestinians and Israelis. Yet diplomats prefer to blame Israel for the lack of peace, making it appear that Israel is the only party at fault and, therefore, the perpetual problem. Moreover, diplomats ignore the fact that what they call the “State of Palestine” is in reality an assumed name, created by little more than a unilateral executive order signed by Abbas that reportedly simply changed the name of the PA (the quasi-governmental administrative entity created under the Oslo Accords) to the “State of Palestine.” The U.S., which legally recognized the State of Israel upon its declaration of independence, has not recognized the PA/“State of Palestine” as a nation-state, and the Palestinians do not have full member-state status at the U.N.
Countries who reject rejectionism often become the targets of the terrorists. An early example of this came in the wake of the 1979 Camp David Accords, the peace agreement between Egypt and Israel. The Arab world was furious with Egypt for its détente with Israel, and feeling betrayed, Arab leaders at the time sought retribution against Cairo. In November 1985, three Palestinian members of the Abu Nidal Organization terrorist group hijacked EgyptAir Flight 648 on the flight from Athens to Cairo. The hijacking resulted in the deaths of 58 civilians, including one American and one Israeli, as well as the maiming of countless victims. As Libya and Syria were both recognized by the U.S. State Department as state sponsors of terror, our law firm, Heideman Nudelman & Kalik, P.C., sued both countries on behalf of the American victims of this heinous act of international terror. In contrast to the PA-PLO policy of rejectionism and terrorism, Cairo has steadily improved cooperation with Israel in recent years, reopening embassies while actively working to rein in Hamas terrorists seeking to leave Gaza, destroy Palestinian smuggling tunnels to the Sinai, and for the first time voting in favor of Israel joining a U.N. committee. The Palestinian leadership continues to rally global support for statehood and claims to be seeking peace, but Abbas has neither appeared at the negotiating table, reduced the vitriolic language toward Israel, cleansed the PA’s textbooks of hate, nor used the billions of dollars the PA has received in aid to truly benefit the Palestinian people. The PA continues to maintain an attitude of rejectionism, using threats and terror as a substitute for diplomacy. Posted on January 14, 2018 by Richard D. Heideman/JNS and filed under Opinion, Israel, U.S., World and tagged Opinion.